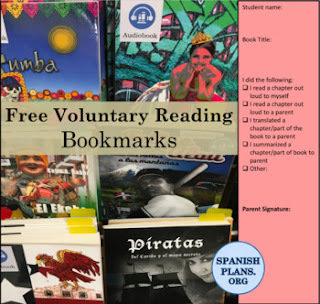 Reading in a World Language Class just got easier with these bookmarks for students that print 5 to a page. One side includes tips for students on how to read in a foreign language. The other side encourages parent involvement in the language acquisition process of their child. While, I do not require any boxes to be checked, some parents may become more intrigued and have their child share the reading experience with them. This is the best type of homework: encourages relationships with parents and gives the students input outside of class. Perfect for teachers who have a classroom library that allows students to check books out and take them home!